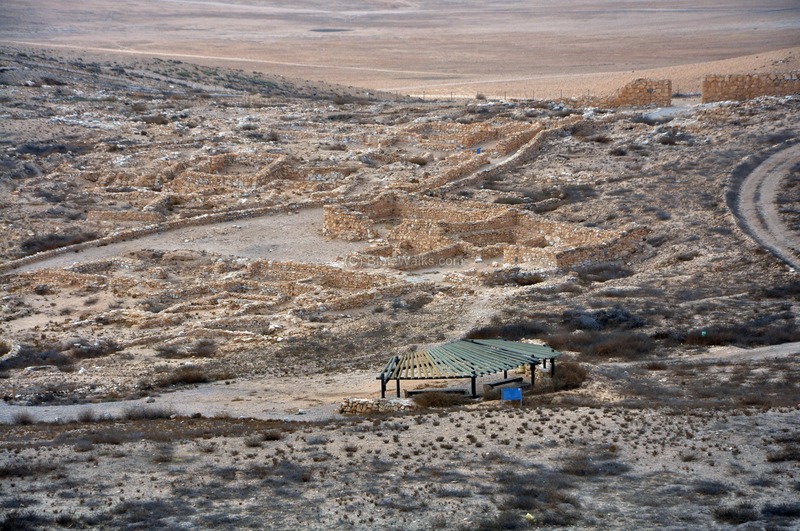 Tel Arad National park consists of the ruins of a large walled Canaanite city and fortresses dated to the Israelite Kingdom period. 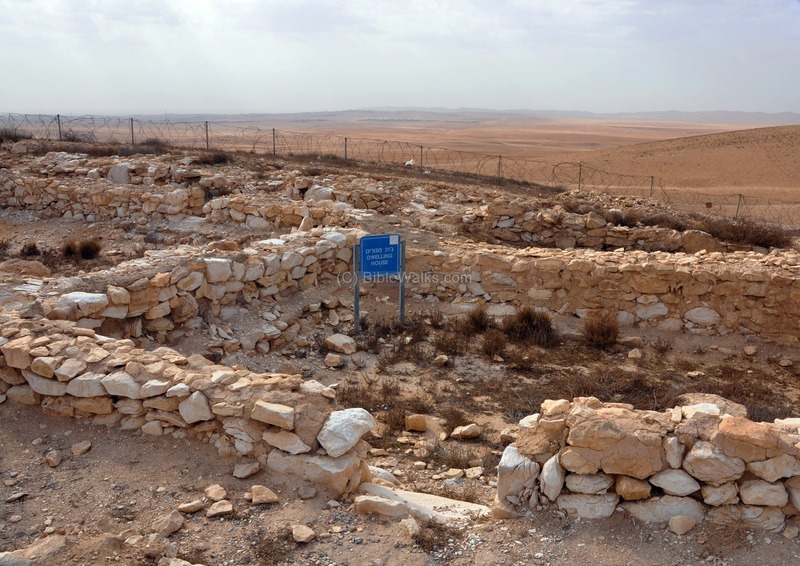 Numbers 21:1: "And when king Arad the Canaanite... heard tell that Israel came by the way... then he fought against Israel...". Tel Arad National park is located in the north eastern Negev desert, and consists of the ruins of a large walled Canaanite city and fortresses dated to the Israelite Kingdom period. The national park covers a large area of 52 (!) hectares, on the west side of road #80, 2.5km north of road #31 (Lehavim-Arad). This aerial map shows the points of interest. You can point on the yellow points to navigate to the selected site within this page. 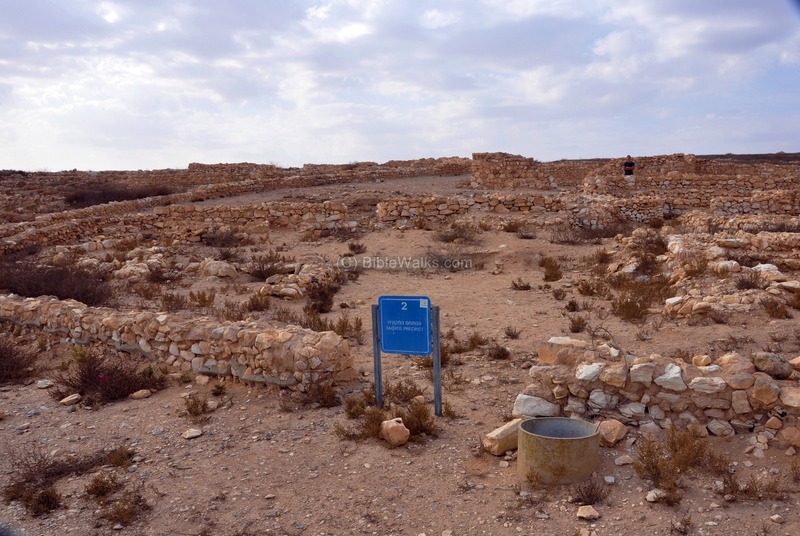 An unfortified scattered settlement was located here during the late Chalcolithic period (around 4000-3400 B.C.). A small unfortified settlement, dated to the Early Bronze Age 1B (3200-3000 B.C. ), was established here. During the Early Bronze II period (2900-2700 B.C.) a large city was built over the earlier settlement. The city was protected by a 2.5m (8¼ feet) thick wall, 1,176m (3,858 ft) long, with semicircular towers along its length. A palace was also constructed on the western side of the city. The city was prosperous, as it was a center of trade and located at a crossroads of major routes. This well planned city, with about 2,500 residents, was divided to quarters with a network of narrow streets. 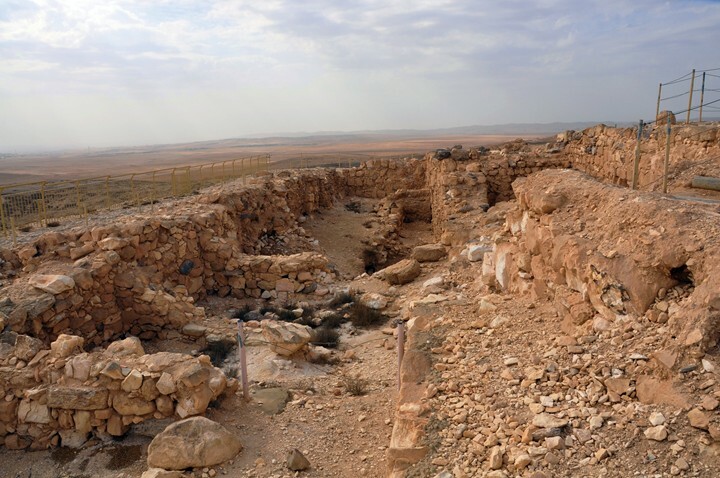 The city was destroyed in 2700 B.C., and a small settlement was built in the 11th Century B.C. In its center was an altar. The city played an important role during the time of return from the Egyptian exile. 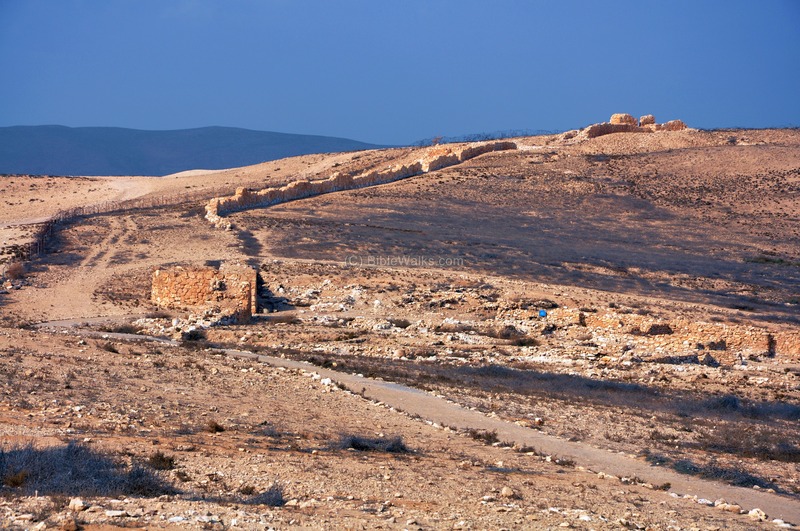 The Canaanites, led by the king of Arad, blocked the first entry of the Israelites from Egypt into Canaan (Numbers 21:1): "And when king Arad the Canaanite, which dwelt in the south, heard tell that Israel came by the way of the spies; then he fought against Israel, and took some of them prisoners". The Israelites vowed a vow to God, and defeated the Canaanites (2-3): "And Israel vowed a vow unto the LORD, and said, If thou wilt indeed deliver this people into my hand, then I will utterly destroy their cities. And the LORD hearkened to the voice of Israel, and delivered up the Canaanites; and they utterly destroyed them and their cities: and he called the name of the place Hormah". 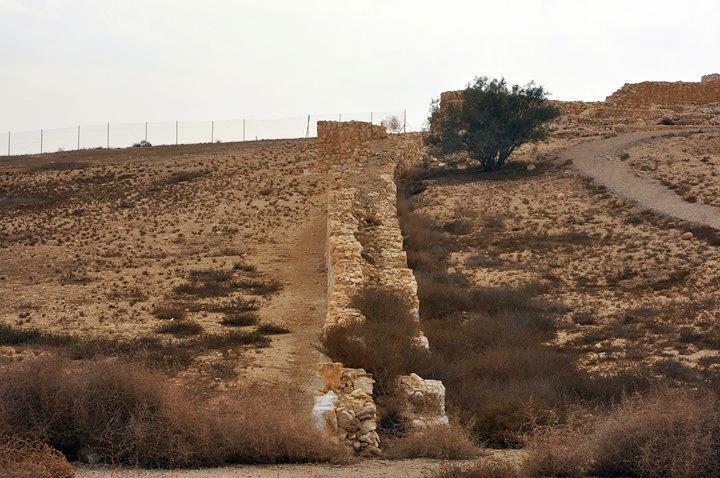 This encounter caused Moses to lead the Israelites southwards towards the Red Sea, bypassing the land of Edom from the south and then east through Transjordan. The event is repeated in Numbers 33:40: "And king Arad the Canaanite, which dwelt in the south in the land of Canaan, heard of the coming of the children of Israel". 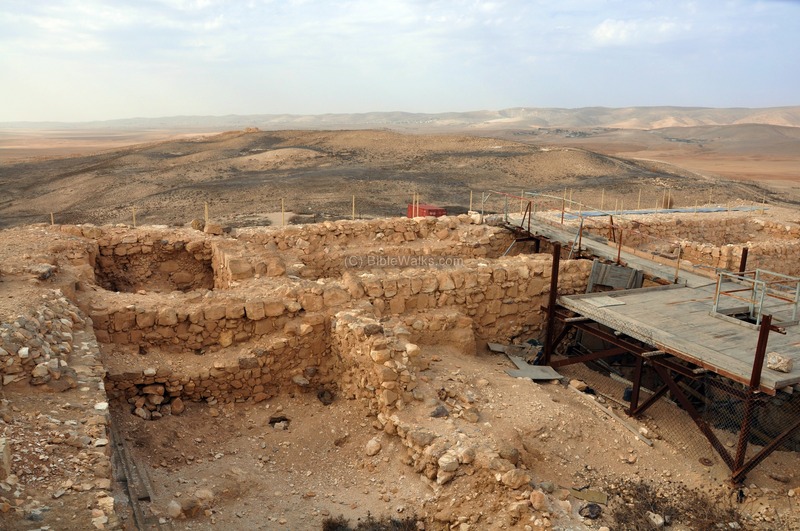 After entering into Canaan from the area of Jericho, the Israelites, led by Joshua, managed to defeat the Canaanites, including the city of Arad (Joshua 12: 7,14): "And these are the kings of the country which Joshua and the children of Israel smote on this side Jordan on the west... 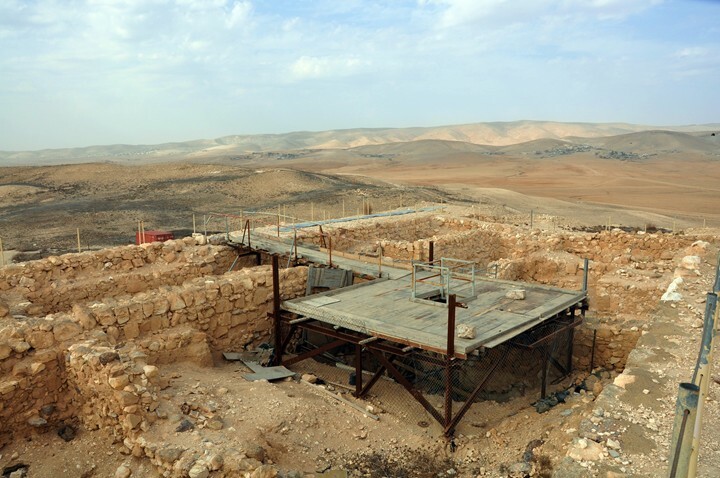 The king of Hormah, one; the king of Arad, one;"
Arad may have been listed in the areas of the tribe of Judea, but the spelling of the name was changed from Arad to Eder (Joshua 15 20-21): "This is the inheritance of the tribe of the children of Judah according to their families. And the uttermost cities of the tribe of the children of Judah toward the coast of Edom southward were Kabzeel, and Eder, and Jagur." The cities and roads during the Canaanite and Israelite periods are indicated on the Biblical Map below. Arad is indicated as a red point, located in the Negev desert between Beersheba on the west and the Dead Sea on the east. A possible location of Hormah, which is mentioned in both verses but not yet identified, is indicated on the bottom left side. Note that the phrase "unto Hormah" has been accepted in Hebrew as meaning a "tough war". 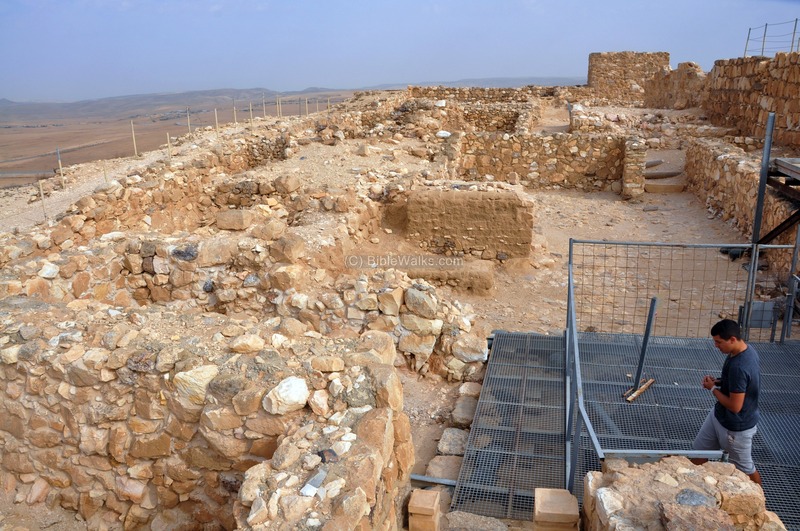 As for the identification of the Bronze age city, there is an issue with the timing: the excavations at Tel Arad did not find a late Bronze age period that fits the time of the Israelite return to Zion. 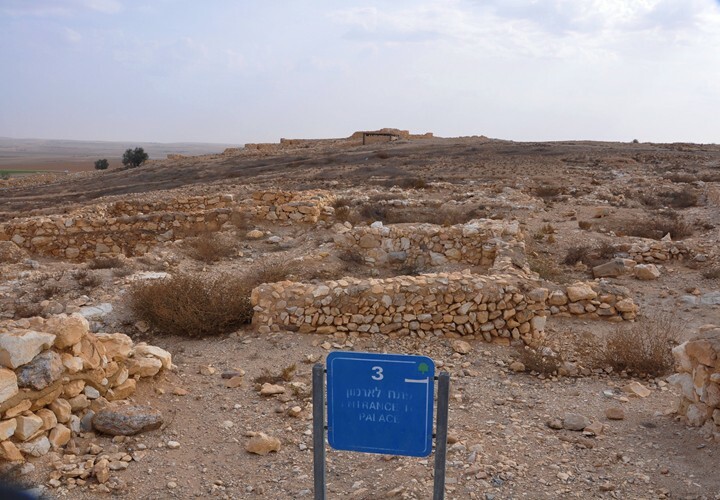 Therefore, it is assumed that the Biblical Arad was the name of a region around the site, while the city was located in another nearby site. 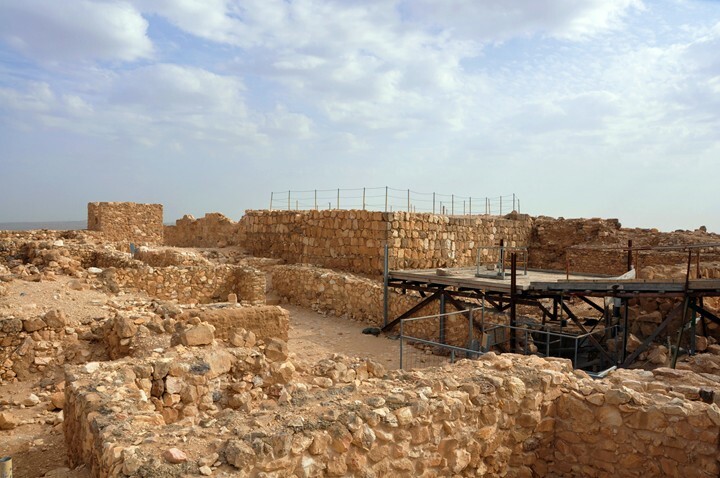 During the 10th Century B.C., perhaps during the reign of King Solomon, a fortress was built on the north-east side of the Canaanite city. "And it came to pass in the fifth year of king Rehoboam, that Shishak king of Egypt came up against Jerusalem". 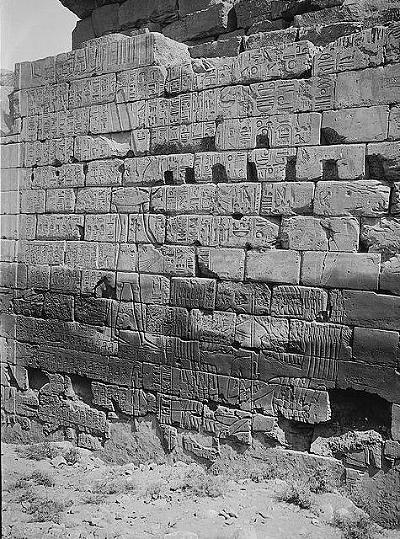 According to the Pharaoh's hieroglyphic inscriptions, Arad is listed as one of the cities that he captured. In the 9th Century a new fortress was constructed on top of its predecessor, perhaps after the Egyptian conquest. The new fortress continued for four centuries, although it was destroyed six times. Two ostraca (shreds with ink inscription), which were found in the excavations, bear the name of Arad - this confirming the identification of the city. The name was also preserved in the Arabic name of the ruins. 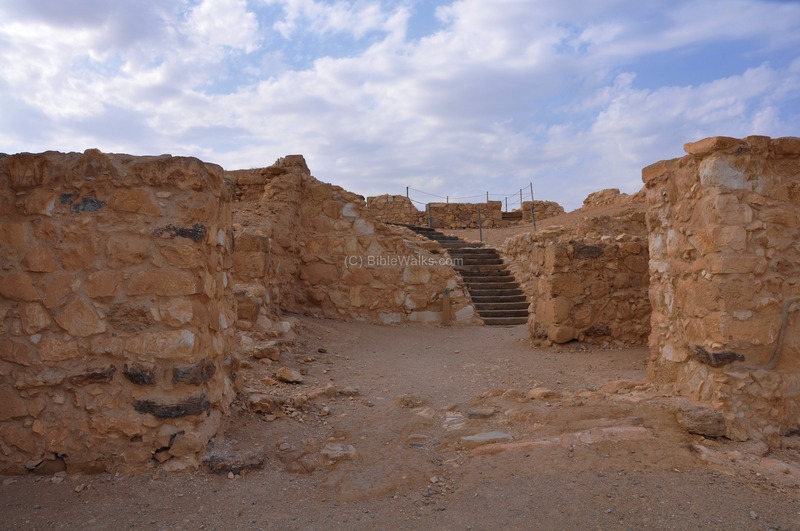 The fortress was repaired and used during the Persian, Hellenistic and Roman periods. 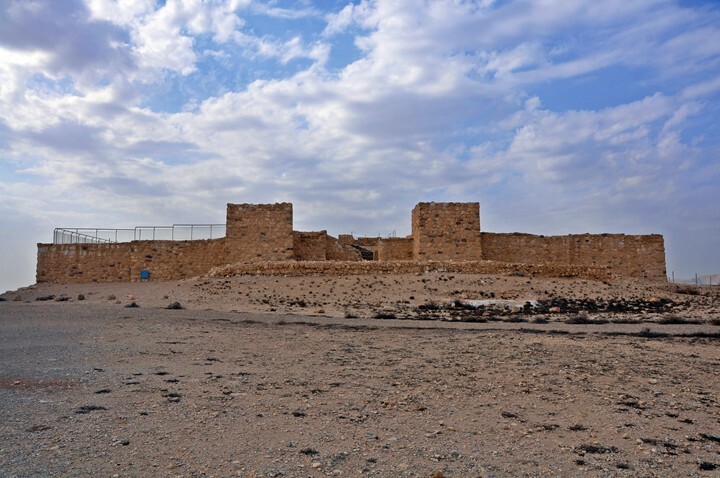 In the Hellenistic period, a tower was built in the center of the fortress. Arad is illustrated as an icon on the 6th C Madaba mosaic map, which was found on the floor of a Byzantine Church in Jordan. The icon illustrates a gate with two side towers, as the plan of the fortress. Above the icon is the Greek 4 letter word "ΑΡΑΔ" (Arad) and the whole title reads "Arad from which come the Aradites.". Its location on the map is inaccurate, being placed south of Beersheba. 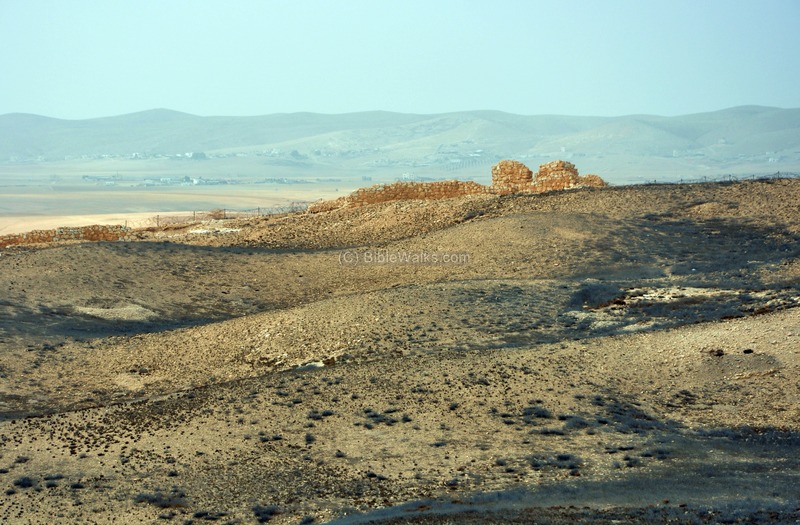 Eusebius Pamphili (better known as Eusebius of Caesarea), a 4th Century A.D. Greek historian of the Church, wrote in his book "Onomasticon" about Arad that it is located 20 miles from Hebron and 4 miles from Malatha, which fits the location of Tel Arad. Arad was finally abandoned at the early Arab period (8th Century A.D.). 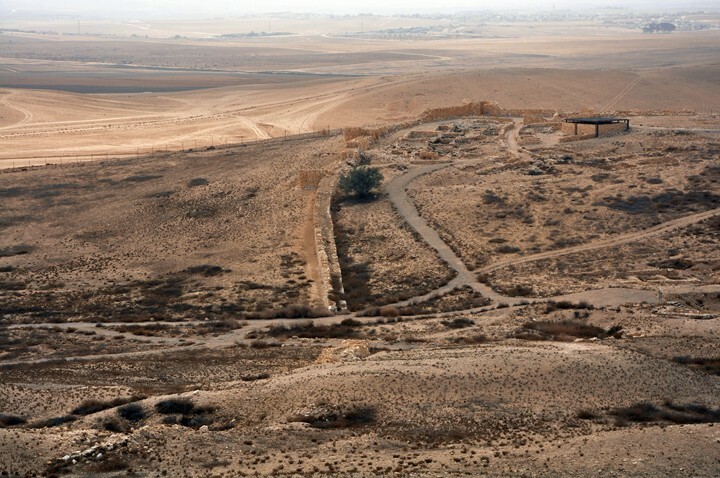 "Arad (Joshua xii. 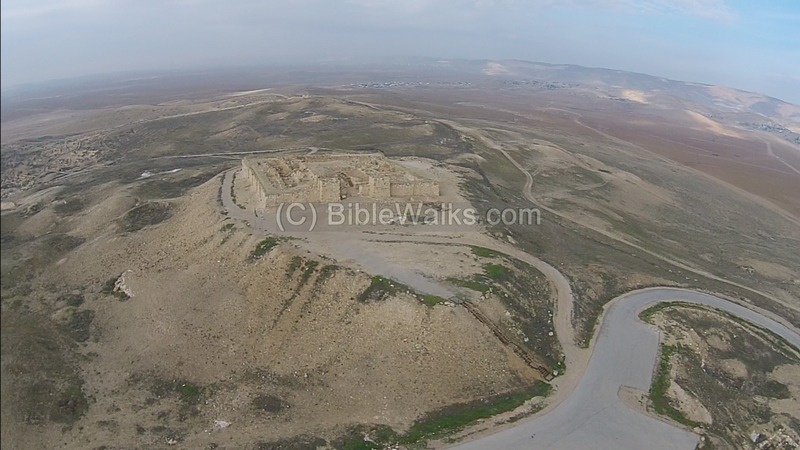 14) is placed in the 'Onomasticon' 20 miles from Hebron, 4 from Malatha. 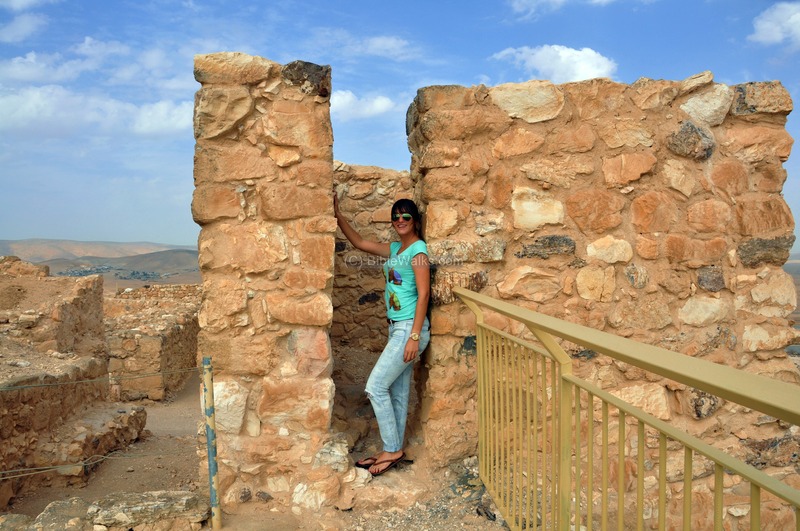 Tell 'Arad is 16 English miles from Hebron, and 7^ English miles from Tell el Milh".
" Tell 'Arad - A large rounded natural hill, with traces of ruins". Excavations of Tel Arad were conducted from 1962 to 1984, headed in most of the years by Yohanan Aharoni and Ruth Amiram. 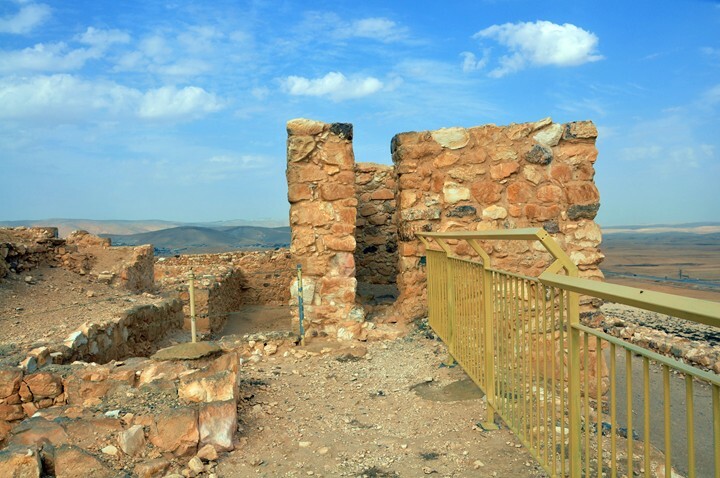 Tel Arad is a national park, and is open to the public. 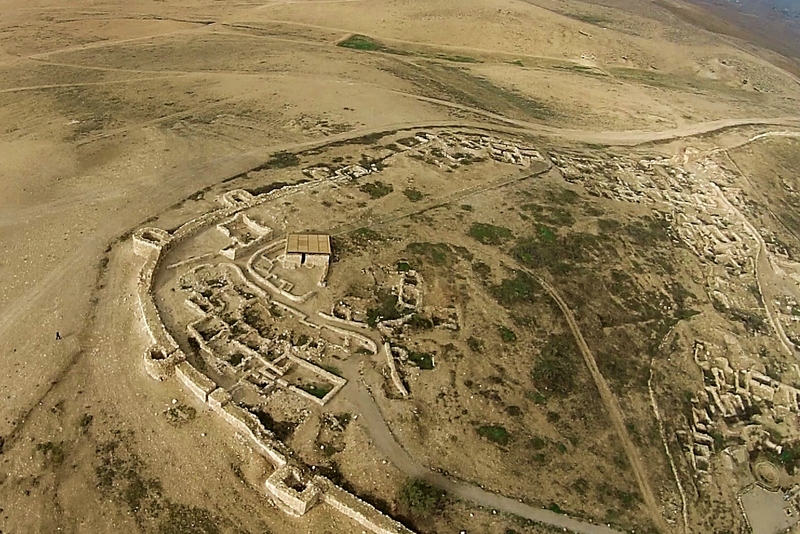 The following photo is aerial view of Tel Arad from the south side. The ruins of the Canaanite city are on the left side, while on the far right side is the Israelite period fortress. 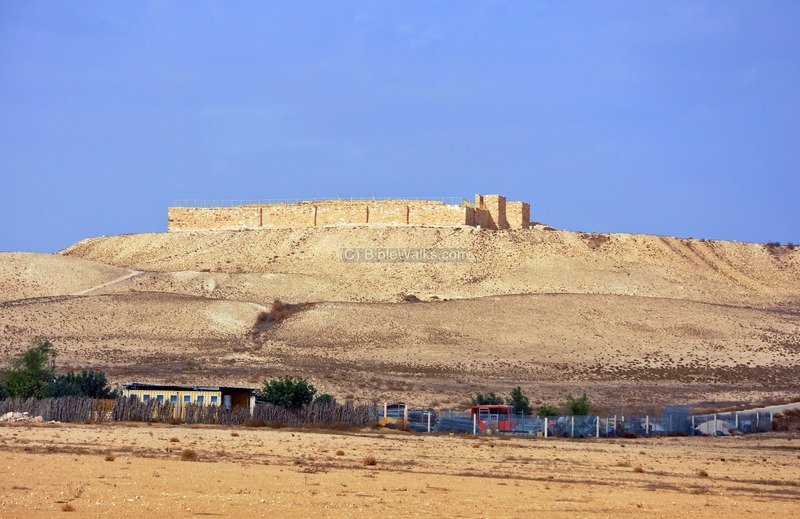 The tour starts from the fortresses mound, proceeds to the Canaanite city, and then back to the entrance to the National park. The total length of the walking tour is about 1,500m, with about two hours to explore the ruins. 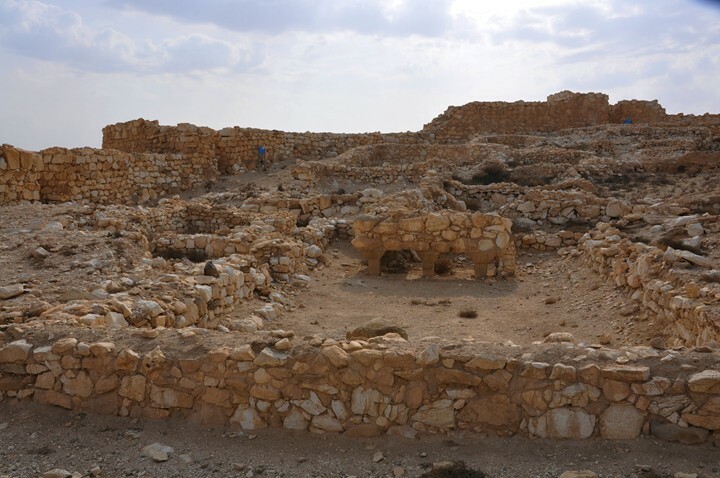 On top of a hill, on the northeast side of the Canaanite city, is a formidable fortress. 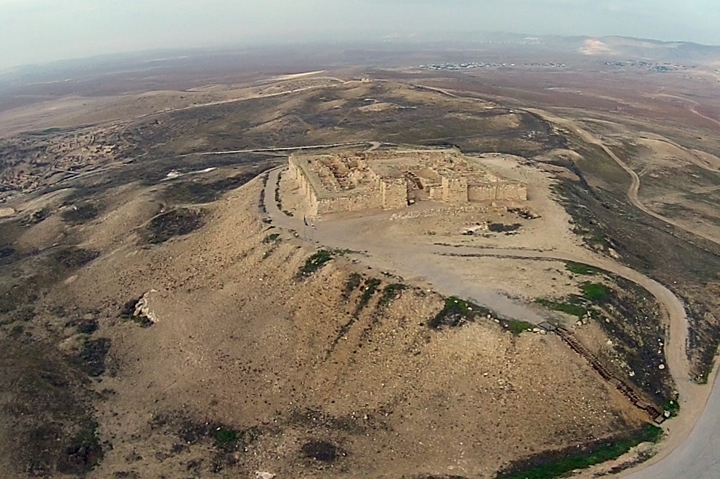 This drone view shows the east side of the fortress. 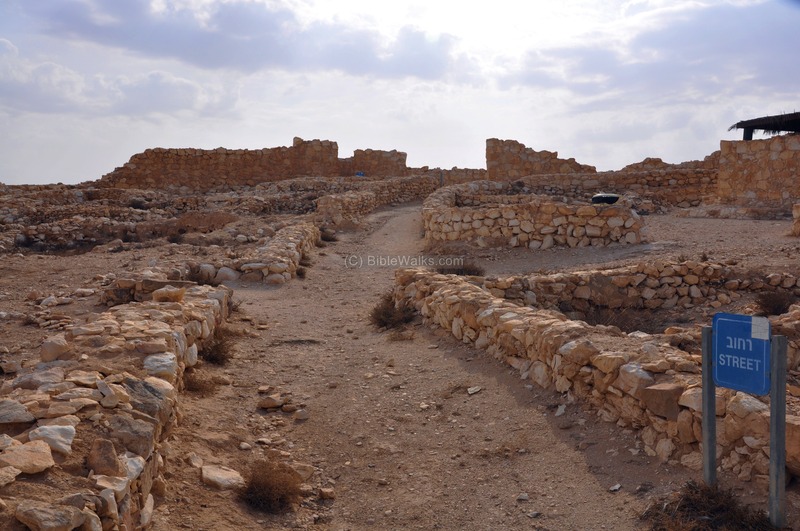 The fortress was constructed in several phases, starting from the 10th Century B.C. (early Israelite kingdom), followed by a fortress dated to the Judean Kingdom (9th to 6th Century B.C.). During the Hellenistic period (3rd-2nd Century B.C.) a tower in the center of the compound. It was repaired and used as a military post during the Persian, Hellenistic and Roman periods. 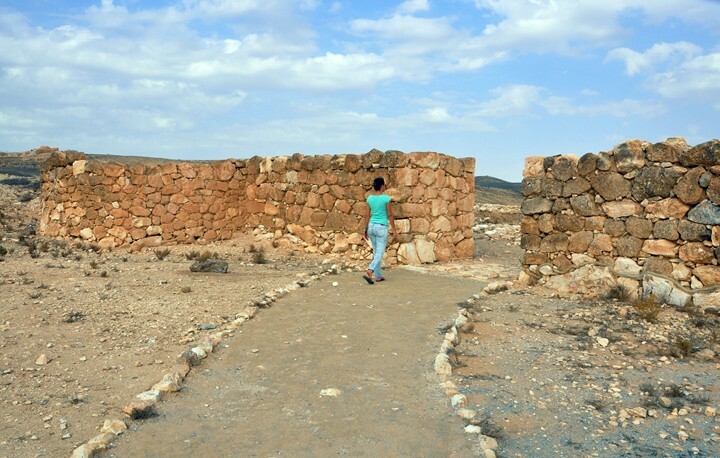 During the early Arab period the structure served as a caravanserai (khan, fondouk, inn), and finally abandoned in the 10th Century A.D.. 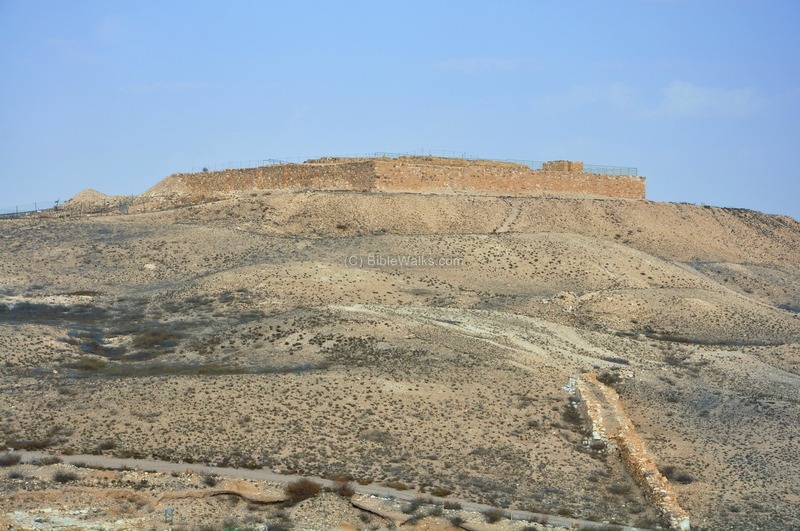 The fortress mound is at an altitude of 576m, or 30m above the center of the Canaanite city. The walls of the fortress, 4m thick, were reconstructed along the entire circumference of the Israelite fortress. Modern steps lead up to the fortress mound from the upper parking place on the east side of the mound. After ascending the steps, the entire east wall of the fortress comes into view. In the middle of the wall is the gate, which is protected by two side towers. Another view of the fortress is seen from the southwest side, as viewed from the south side of the Canaanite city. Two side towers are located on both sides of the gate, which is located on the east side of the fortress. 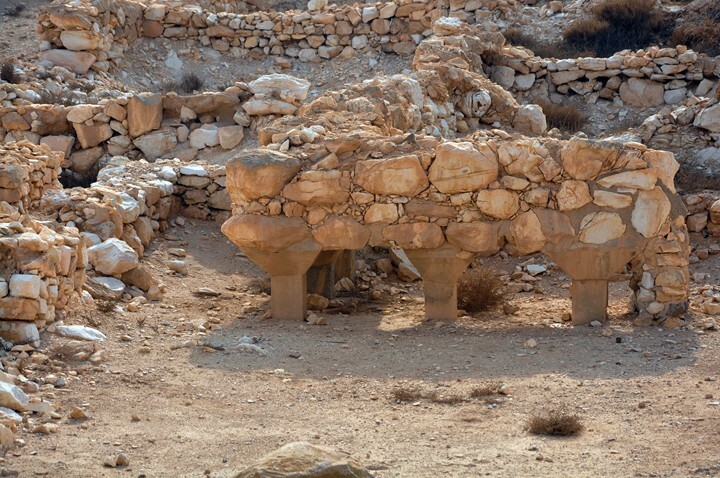 These gate towers were constructed during the period of the Judean Kingdom (9th-6th Century B.C.). 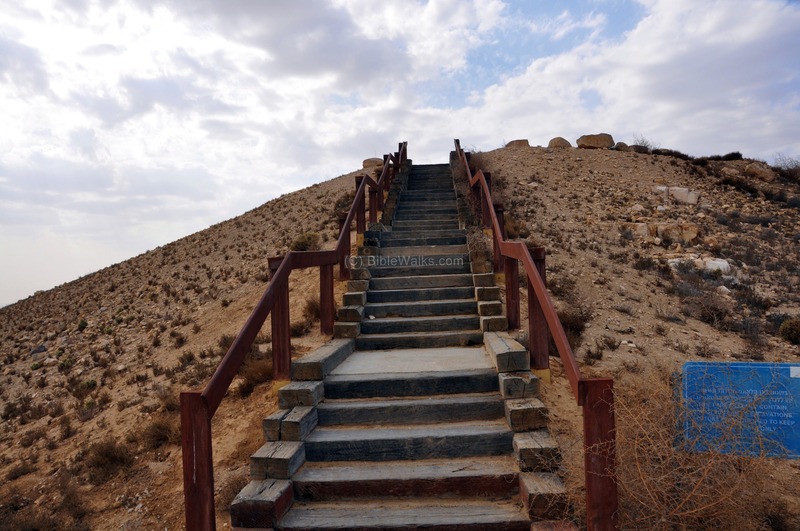 The fortress followed the plan of an earlier fortress of the 10th Century B.C. 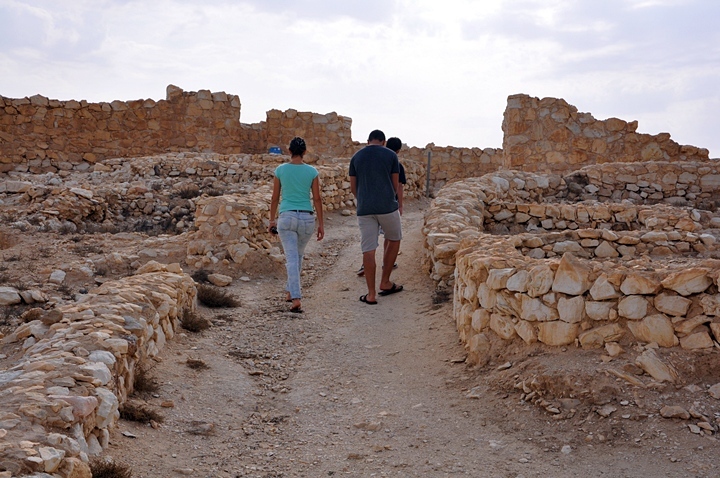 Past the gate are steps that lead up to the central tower, which was constructed in a later (Hellenistic) phase. The side gate tower on the north side of the gate is seen in the following photo. Webmaster Rotem stands on the entrance to the southern gate tower. In the center of the fortress mound is a another tower which is dated to a later date (3rd-2nd Century B.C.) - the Hellenistic period. 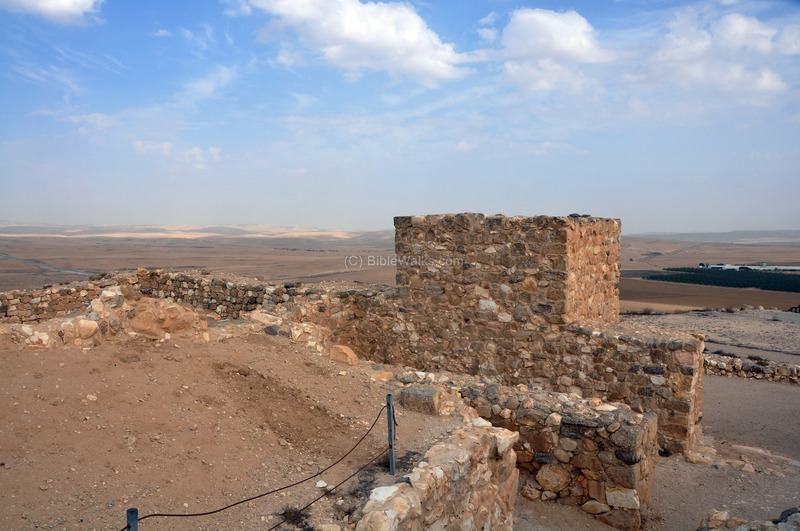 On top of the Hellenistic tower are great views of the fortresses, the Canaanite city and the area around Tel Arad. A view towards the north is seen below. A grey line along the walls show the level of the ruins prior to their reconstruction. 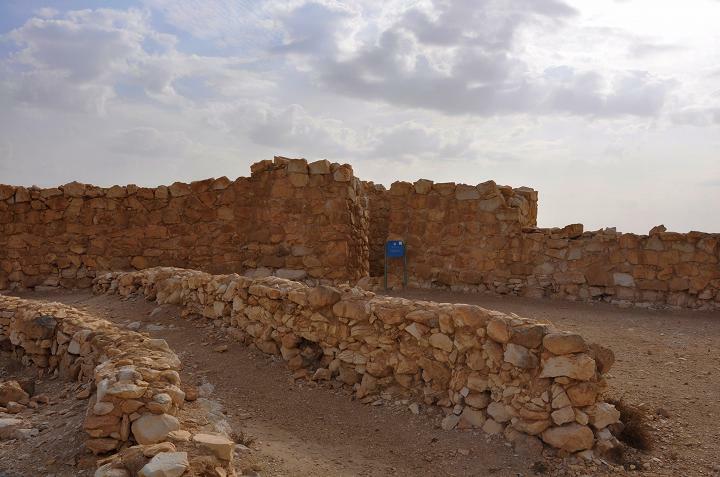 The north side of the fortress includes storehouses, located on the east side, and a shrine on the west side. On the north-west side is a platform, which covers a large plastered underground water reservoirs, which are located under the fortress compound. A stone hewn channel runs from the outer side of the western wall into the reservoirs. This allowed to raise water fetched from an external well to the channel on the outside of the wall. The water then poured through the channel and filled up the reservoirs. 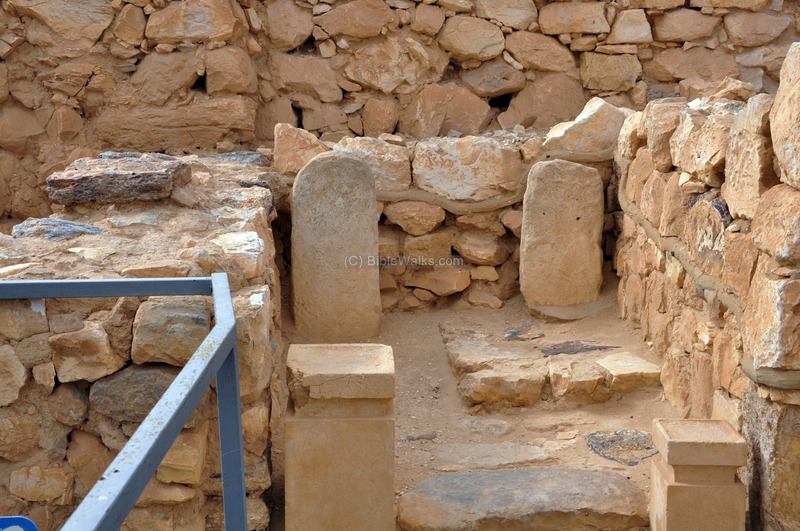 An Israelite shrine, dated to the Iron age city (9th-6th Century B.C. ), is located on the northwest side of the fortress. 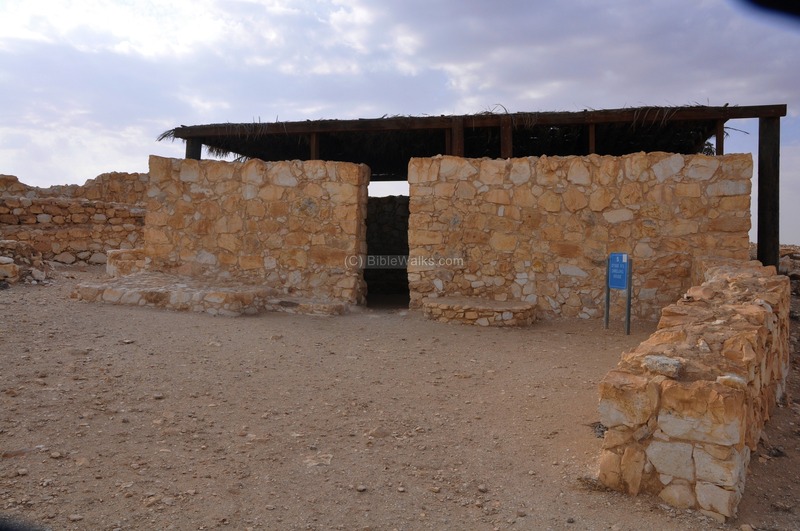 It has a westward orientation, and its plan resembles the Biblical description of the tabernacle: an entrance hall, a main hall, with 3 steps leading to the Holy of Holies. A view of the shrine is seen in the photo from the west side. Along the eastern side of the main hall, behind the gray fence, was a large courtyard. On its center was an altar. 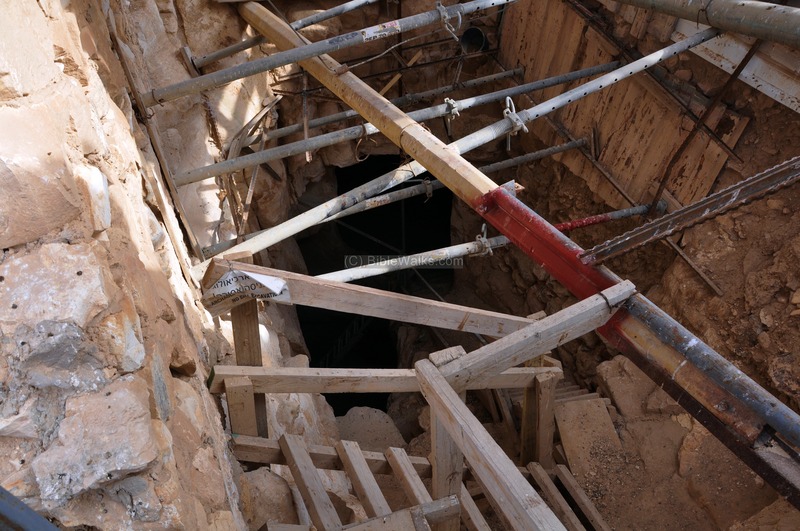 The entrance to the Holy of Holies is seen here on the bottom (west) side. Various ritual objects and other findings were found here in the excavations, including two ostraca (pieces of ceramics with writings) naming Pashur and Meremoth - who were priestly families mentioned in the Bible. The temple includes a square sacrificial altar, used for burning offerings, which is seen below in the center of the temple's courtyard. The measurement of the altar fits the Biblical description - having a size of 5 square cubits (Exodus 27:1): "And thou shalt make an altar of shittim wood, five cubits long, and five cubits broad; the altar shall be foursquare: and the height thereof shall be three cubits". It was erected from bricks and unhewn stones, as also commanded (Exodus 20: 24-25): "An altar of earth thou shalt make unto me, and shalt sacrifice thereon thy burnt offerings, and thy peace offerings, thy sheep, and thine oxen: in all places where I record my name I will come unto thee, and I will bless thee. And if thou wilt make me an altar of stone, thou shalt not build it of hewn stone: for if thou lift up thy tool upon it, thou hast polluted it". The Holy of Holies was located in a chamber on the west side of the altar, accessed by three steps. Two incense altars flanking the entrance, and two standing stones are on its rear side. A small Bamah (stage, or high place) is located on the rear side. "These are the statutes and judgments, which ye shall observe to do in the land, which the LORD God of thy fathers giveth thee to possess it, all the days that ye live upon the earth. Ye shall utterly destroy all the places, wherein the nations which ye shall possess served their gods, upon the high mountains, and upon the hills, and under every green tree. And ye shall overthrow their altars, and break their pillars, and burn their groves with fire; and ye shall hew down the graven images of their gods, and destroy the names of them out of that place... Then there shall be a place which the LORD your God shall choose to cause his name to dwell there; thither shall ye bring all that I command you; your burnt offerings, and your sacrifices, your tithes, and the heave offering of your hand, and all your choice vows which ye vow unto the LORD". 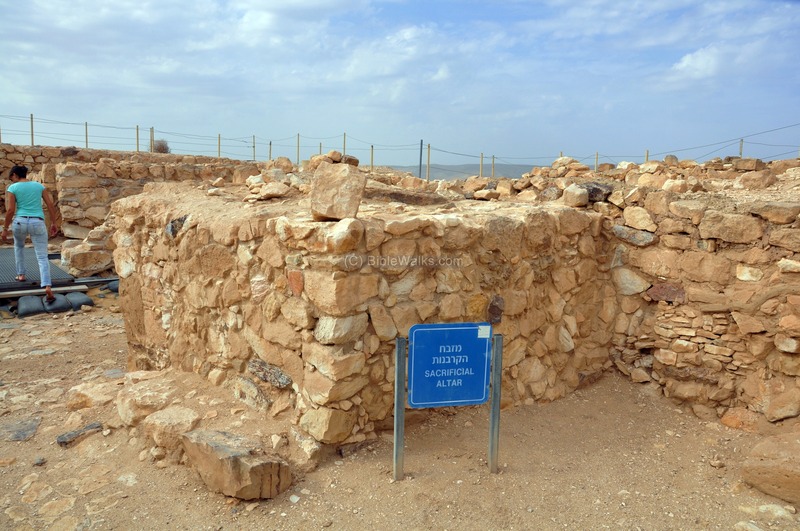 Note that Y. Aharoni, who excavated the temple, found a similar plan in the "Solar shrine" in Lachish. The south side of the fortress includes a number of residential structures. This is a view of the southwest towards the west. The north-west corner Canaanite city wall can be seen on the ridge in the far background, at a range of 300m. A view towards the south west is seen in the following photo. 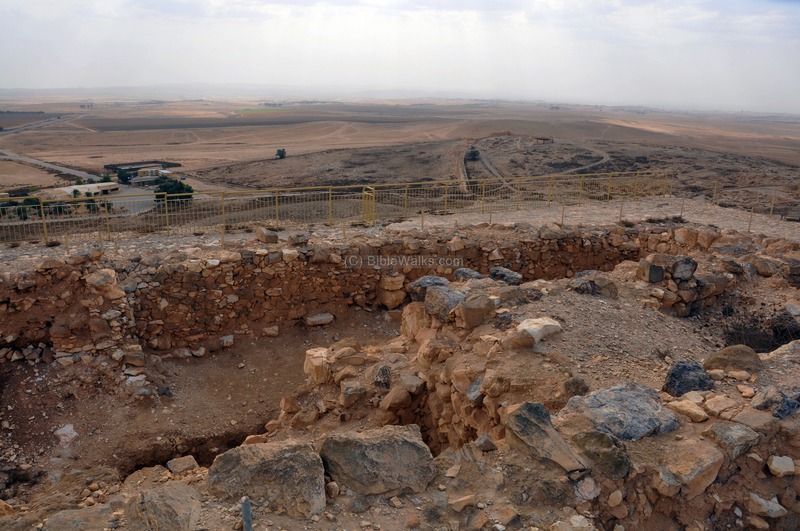 The visitor center is on the left background, and the south side of the Canaanite city and its wall can be seen on the right background. 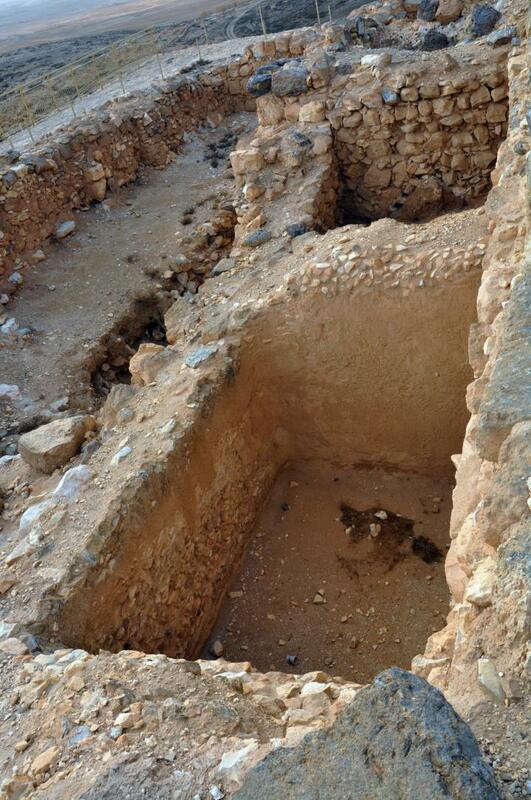 Among the residential structures is where one of the great findings was found. 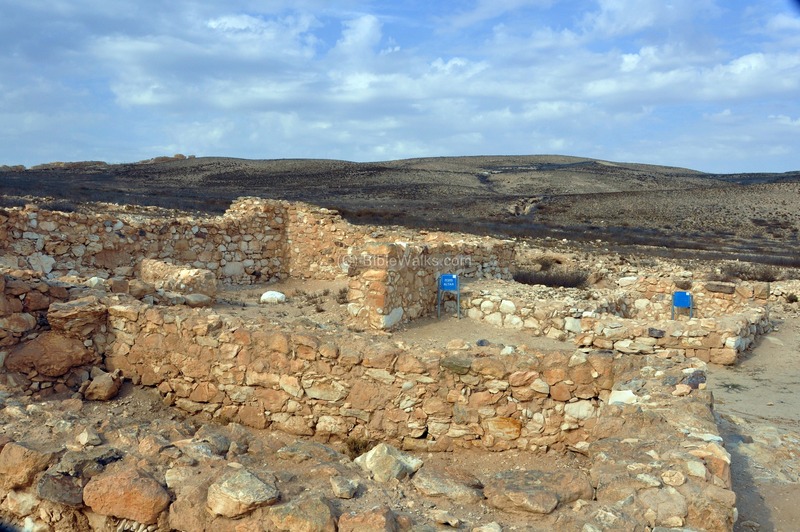 The house, named "Eliahsib's house", contained an archive of ostraca (in singular - Ostracon, a piece of ceramics with writings). The Ostraca contained letters dispatched to Eliashib son of Eshyahu, which was a high ranking officer or the commander of the fortress at the end of the 7th Century B.C. The letters contain orders to supply bread and wine to travelers, and include names of places - Beersheba and the "house of God" (Jerusalem). 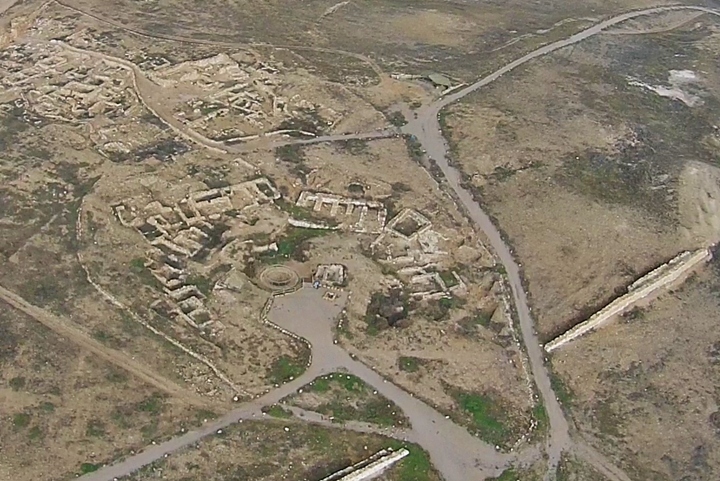 A drone view, captured above the south side of the Canaanite city, is shown here. 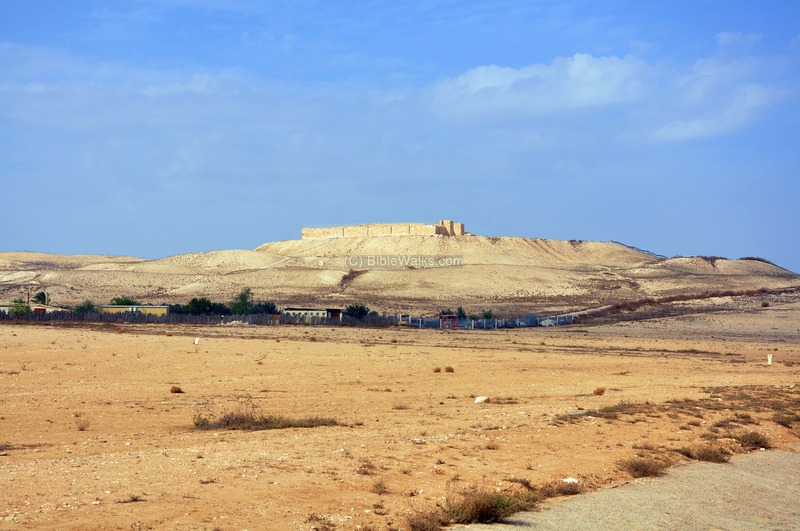 The city, located southwest of the fortresses mound, was constructed in the Early Bronze period (2900-2700 B.C.) and existed for 350 years. The Canaanite Arad city covers a large area (10 hectares). 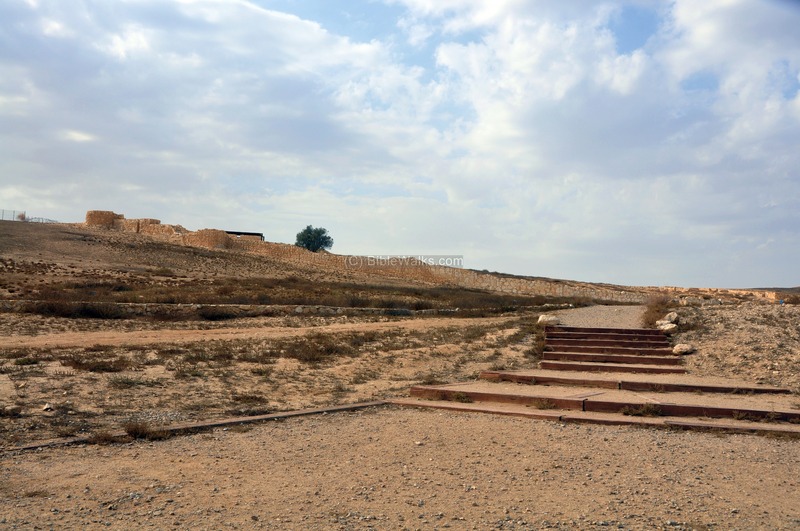 A path leads from the park's entrance to the south side of the Canaanite city, seen in the following photo. 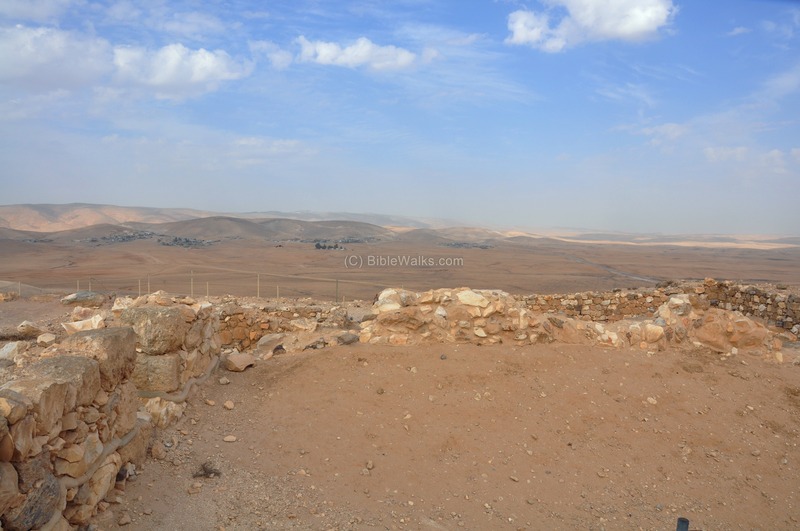 Here are some views of the vast area of the city, which is partially excavated. 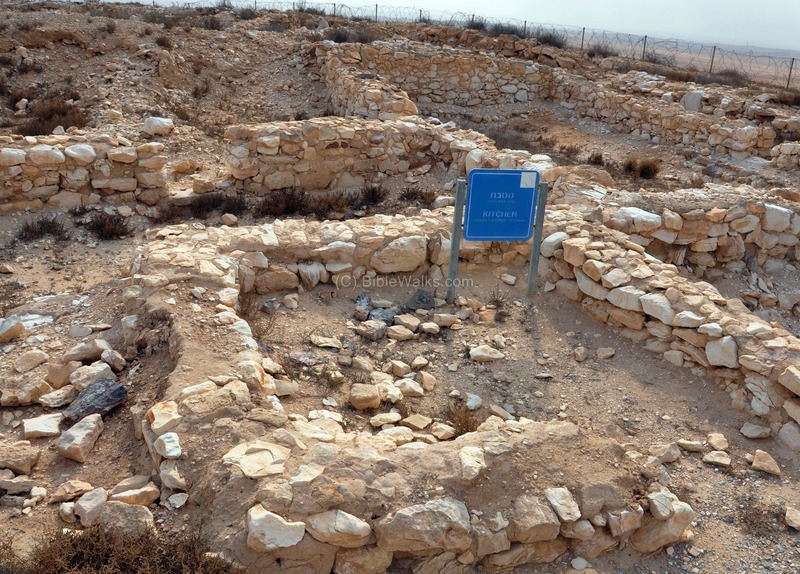 A section of the city was excavated on the south-east side. Its location is marked by a yellow square on the aerial view on the right. 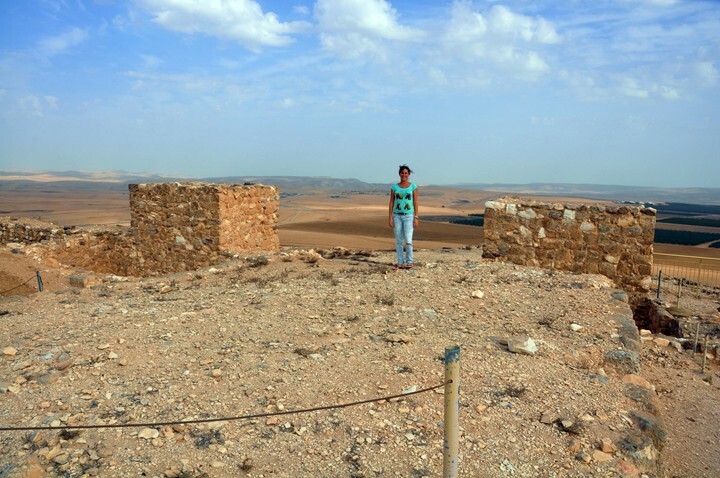 This was the center of the city, and the lowest place in Arad. This is why the water supply - a well and storage pools - are located in the location. The following drone view shows the area around the well. 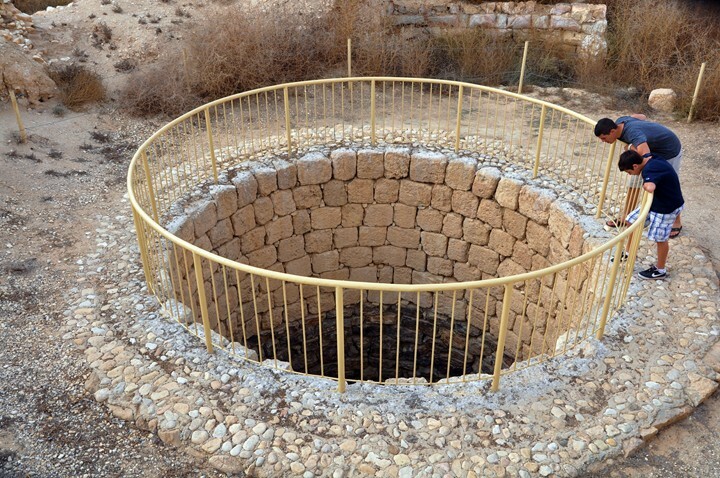 The large well is located close to the city wall. It was first constructed by the Canaanites, then the well was enlarged during the Judean Kingdom times to a depth of 16m (52.5 feet). The well supplied water to the fortress, using pack animals that carried the water to the west side of the fortress, where the water was raised and poured into a channel to fill the reservoirs inside the fortress. 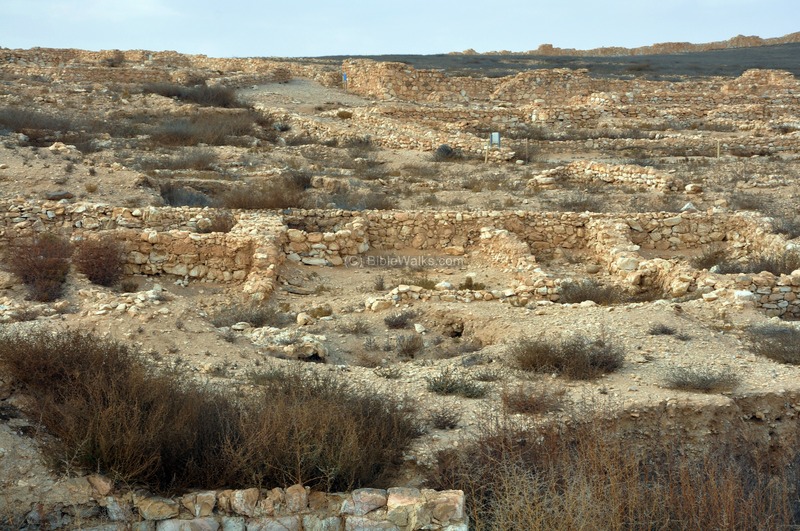 During the Herodian period (1st Century B.C.) 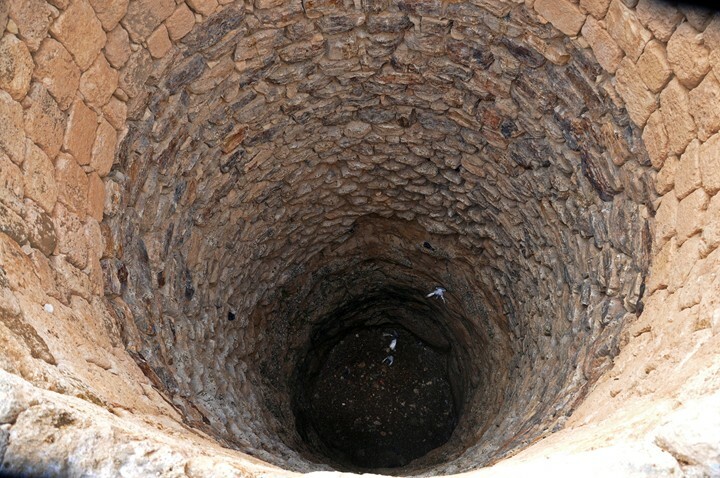 the well was renovated. Several plastered storage pools, also constructed during the Herodian period, were constructed near the well. This well planned city, with about 2,500 residents, was divided to quarters. The residential houses were based on a uniform "Aradian" design - a broad house plan based on a rectangular room which was entered from the courtyard along its long side. One of these Canaanite houses was reconstructed on the south side of the city. Its location is marked by a yellow square on the aerial view on the right. The entrance to the house is seen in the photo below. A step leads from the open courtyard down to the inner section. Stone benches were constructed along the walls. In the center of the room is a pillar, which supported the ceiling. The roof was made of wooden beams and palm tree branches. The base of another "Aradian" residential house is seen in the following photo. Notice the entrance to the house in the center of the long wall, with one step leading down from the open courtyard. A room on the side of this house was a kitchen, with a cooking platform in the corner. In the center of the city, north of the main street, is the sacred precinct - an enclosure containing two twin temples and their courtyards. Its location is marked by a yellow square on the aerial view on the right, and a view from the north side is in the following photo. A closer detail of the right temple is seen in the following photo, with an altar in front of the wall. 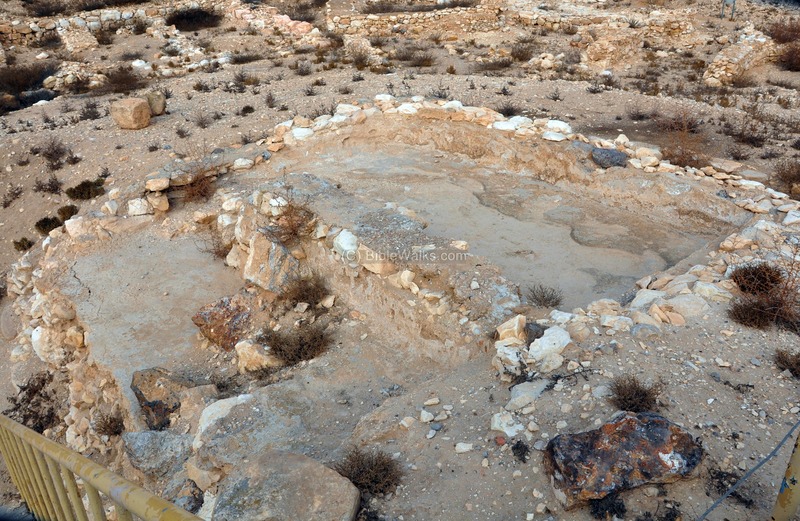 A hewn monument, stone basin and articles of worship were found in the compound. The courtyards of the twin temples are seen in the next photo. The Governor's palace is located on the west side of the city, south of the main street, and near the temples area. The palace includes a central hall, living quarters, courtyards, chambers and storerooms. 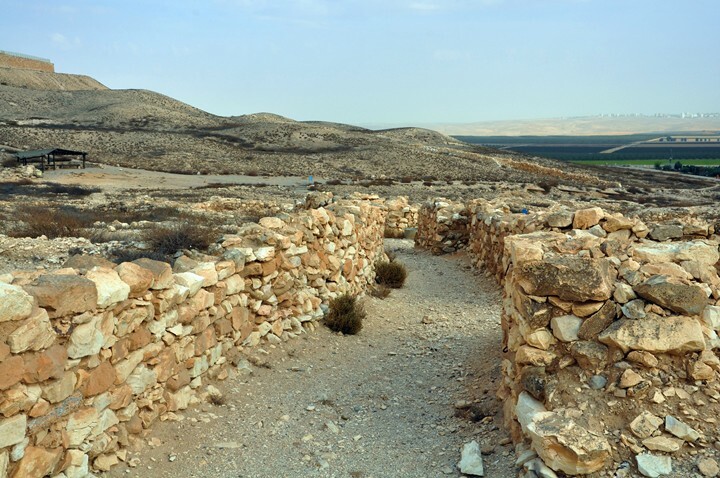 The Bronze age city was protected by a 2.5m (8¼ feet) thick wall, at a total length of 1,176m (3,858 ft). There were at least 2 gates. This one is on the west side, near the palace. Along the inner side of the wall was a ring road, as in the picture below. 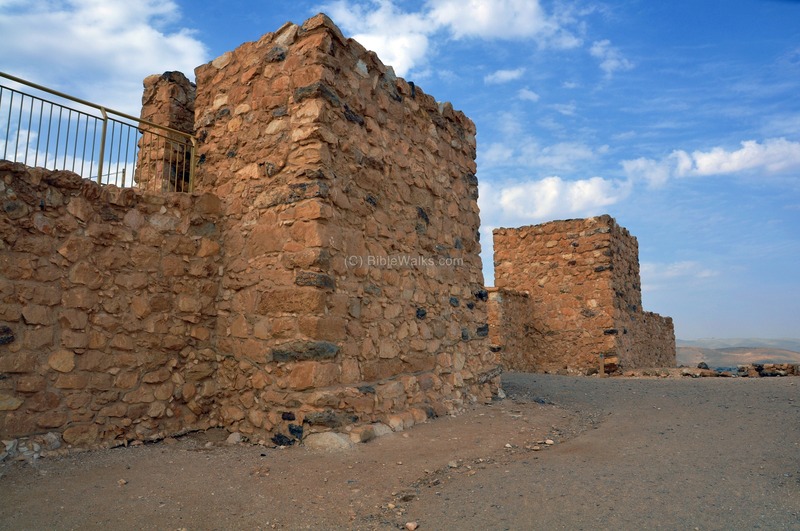 Watchtowers were built along the external side of the wall, built with a semi-circular or square design. This tower is located on the west side, near the palace. A section of the wall and a watchtower is seen here on the west side of the city. A section of the south wall is seen in the next photo. One of the square watch towers is seen on the external side of the wall.